On September 25, 1839, businessman Roswell Beebe received title to all of the land in Little Rock. Starting in the 1810s, there had been much dissension as to who had title to land in what would become Little Rock. As the settlement developed into a town and city, these disagreements became greater. Often land speculators would sell land to settlers without having the right to do so. Coming to Little Rock in 1835, Beebe was a witness to the continued uncertainty over land ownership. In early 1839, he acquired 240 acres which had the only incontestable title in town. This acreage comprised most of Little Rock. He went to Washington DC in 1839 and, on September 25, received the original patent for the town of Little Rock, signed by President Martin Van Buren. It is recorded in the Pulaski County recorder’s office Book L, page 312. Upon his return, Beebe gave all the people who had bought lots from a certain real estate developer, whom he considered to be fair and honest, title to their land for a dollar. 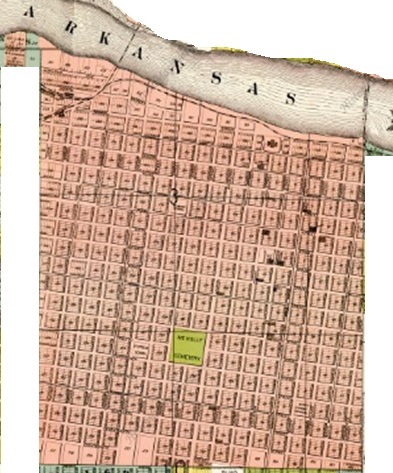 In December 1839, he drew up a plan for Little Rock, laying off blocks and streets. He deeded the streets and alleys to the city for a dollar. He gave the state the title for the land on Markham Street, where the new capitol building (now the Old State House Museum) was located. He also donated part of the land for Mount Holly Cemetery, the other portion came from his brother-in-law Chester Ashley. Mayor Fulton married Elizabeth Savin in June 1795 in Maryland. She died in November 1829, while they resided in Alabama. Among their children was William Savin Fulton who served as Territorial Governor of Arkansas in 1835 and 1836 and was one of Arkansas’ first US Senators upon statehood in 1836. Mayor Fulton was serving as Mayor at the same time his son was Governor. Mayor Fulton came to Little Rock in 1833. His daughter Jane Juliet Shall and her four children came to Little Rock as well. The family made the move to be nearer to the future governor. The Fultons and Shalls rented the Hinderliter House (now part of Historic Arkansas Museum) in 1834. Upon his return, Beebe gave all the people who had bought lots from a certain real estate developer, whom he considered to be fair and honest, title to their land for a dollar. In December 1839, he drew up a plan for Little Rock, laying off blocks and streets. He deeded the streets and alleys to the city for a dollar. He gave the state the title for the land on Markham Street, where the new capitol building (now the Old State House Museum) was located. He also donated part of the land for Mount Holly Cemetery, the other portion came from his brother-in-law Chester Ashley.